Poa tenera F.Muell. ex Hook.f. Description: Flaccid, trailing or tufted perennial with stolons to 2 m long. Leaves with sheath becoming loose, thin, smooth or slightly scabrid; ligule firmly membranous, 0.5–1.5 mm long, truncate; blade often flat, or folded and inrolled, 1–1.5 mm wide, usually smooth. Panicle 2–12 cm long, at length spreading, branches filiform. Spikelets compressed, 2–4-flowered, 3–4 mm long. 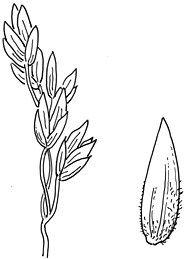 Glumes 1–2 mm long, acute to obtuse, lower 1–3-nerved, upper 3-nerved. Lemmas obtuse, 2–3 mm long, distinctly 5-nerved, usually minutely pubescent on the internerves, nerves and margins below; web often obsolete. Palea usually very delicate; very finely scabrous on the keels above. Distribution and occurrence: Grows in shady and moist but well drained situations.